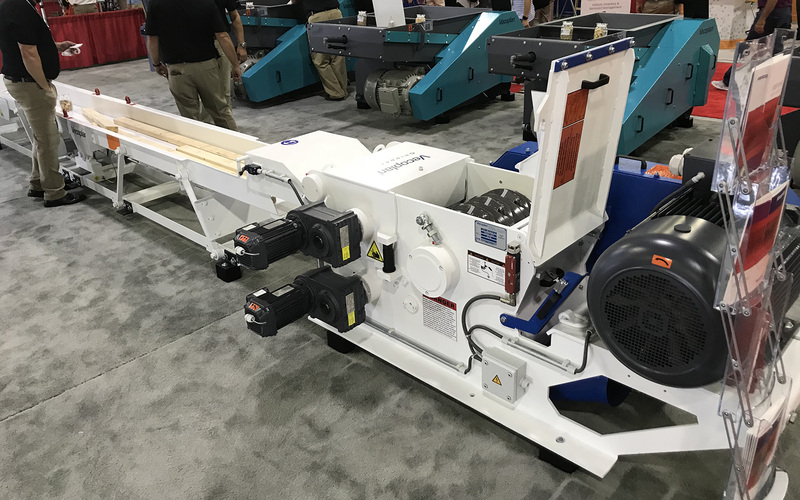 The International Woodworking Fair is the premiere showcase for everyone who supplies machines, services, or materials to woodworkers of all stripes. Every two years, woodworkers at all levels — from small cabinet shops to billion dollar furniture companies — come together in Atlanta to shop, learn, and swap war stories. We attended this year with one important goal: to see what kind of machinery could help support our long-term growth. We're considering adding several new capabilities as well as some level of automation to our facility. The question we're asking is, what will meet our customers needs over the next 1 to 3 to 10 years. Since the sale of our Dallas facility, we have more flexibility to fund our growth, but we don’t want to spend like a drunken sailor. We need to balance ROI with the immediate capacity and capability needs we have. We'd like to automate specific processes, like introducing core to the glue line, flow to the machining stations and into packaging. Here's what we saw at the show for each area we're considering. We came to IWF with a pretty good idea for automating this step. Our challenge is to be able to move raw material from a well organized holding area into a staging area based on the current production schedule. After that it would load into the glue line and get pressed—all while being able to keep up with our capacity needs. For this material retrieval approach, we need a solution able to handle at least 600 panels a shift that could scale up closer to 1000. We know we can always add another shift or two for the glue line—that’d be a great problem to have—but right now we’re just thinking ahead and preparing for growth. We looked at solutions from too many companies to list, but the solutions that rose to the top are from IMA/Shelling, SCM, Stiles and Biesse. 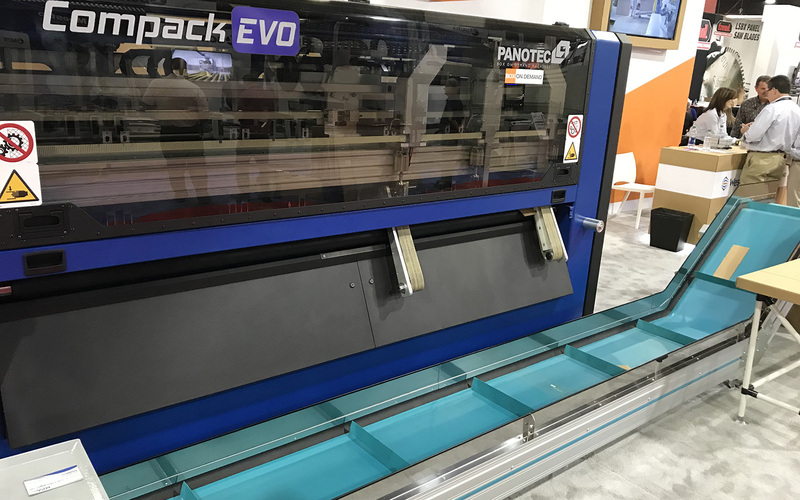 One issue we ran into is that material storage solutions are primarily designed to feed saws or routers and wouldn't be able to keep up with our glue line, based on our capacity we need a panel to be pressed every 28 seconds and these solutions tend to run around 60 seconds per sheet. Currently, we press or panels on a Black Brothers cold press. This has been a great line for us and works well for making panels and keeping up with our capacity needs. However we are seeing customer requests for new materials that are making us believe a PUR line would be a benefit for them. 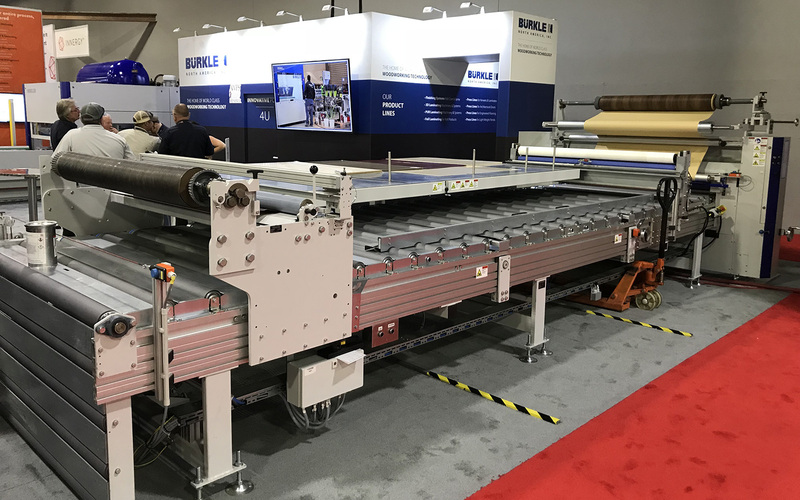 We looked at several PUR systems during our time at the show, including those from Burkle, Barberan, and Union. The jury is still out (lots to consider with each, like the best glue to use with either) but we left the show still convinced that PUR would be the best solution for us. Another process hurdle is moving panels to different machines around the shop. We'd like to replace a system of manual conveyers and transfer carts with automated conveyers and gantries. Again, we looked at solutions from all the major players at the show. Our next step is to evaluate different proposals and determine which one not only meets or exceeds our current system, but also integrates with our current and future machines. 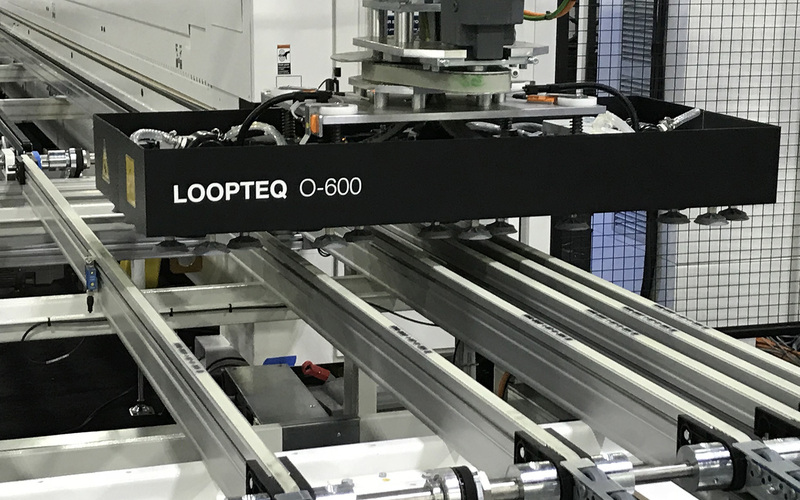 Would automation be able to maintain the same level of production as our current straightline edgebanding loop? 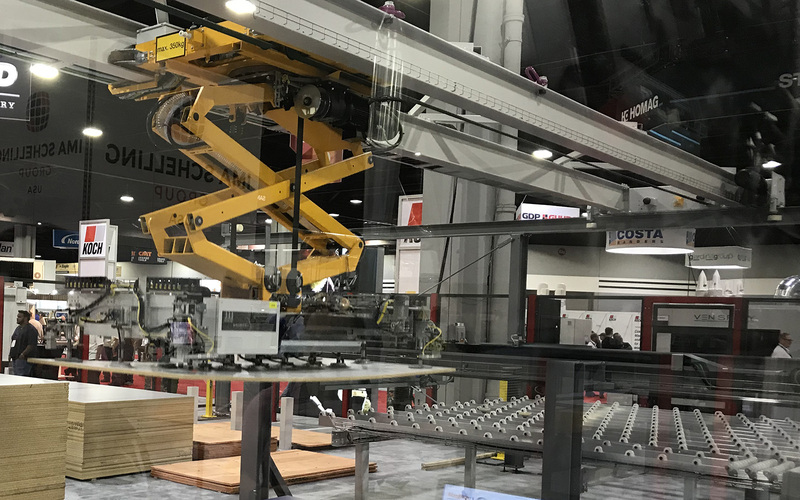 At IWF, we saw solutions that used conveyers only or conveyers and a gantry to loop parts through the edgebander, and then move them to the next step in the process. Sure, the new systems are very impressive—especially the ones using both gantries and conveyers—but our challenge is two-fold. One, how to both introduce new parts into the system and get finished parts out. Two, how to handle the large variation in size between our parts. The machines we saw were either really good a working with small or large sized parts, but not both. Our customers parts can be anywhere from 4" x 24" to 4' x 12'. Another factor in our decision is capability. We're getting more requests for edgebanding technology with no visible glueline. To achieve that, we looked at several solutions for hot air and laser edgebanding that can edgeband without a glue line. Homag has good solutions using hot air. IMA’s laser options could also work for us. There's a good chance whatever solution we implement will require removing a few dumpsters around our cutting machines. The best option is grinding up our drop and feeding it into the dust collection system. We narrowed our options down to two contenders at the show, Vecoplan and Weima. Both were very impressive and Weima had two of their machines running at the show. One thing’s for sure, we'll need a sound enclosure for any grinder we choose. Those things are deafening! Another project on our automation list is packaging. We have a standard method for packaging panels and parts and we also have customers with specific needs and solutions tailored just for them. Several box and strapping systems at IWF looked pretty interesting. We’re still working on a solution and will share updates in a future blog post. We may not advertise placing hardware on our parts among our capabilities, but we are adding it to more customers solutions to help meet their needs. And we're always looking at new capabilities that would solve problems our customers ask us about. 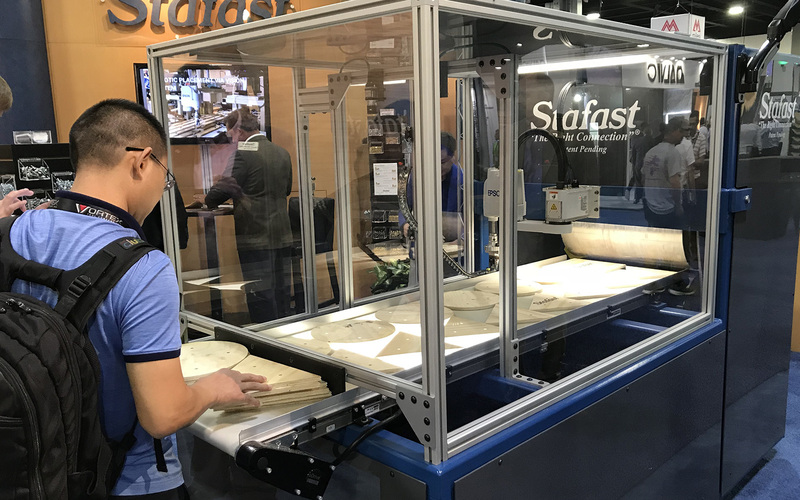 A cool machine from Stafast caught our eye at the show—it can do threaded inserts with a combination of video sensors and a robotic arm. This could be exactly what one our newest customers needs. Seeing it in action at the show was impressive, it could pick out specific holes to put inserts in, or not put them in. We left the show with a lot of new ideas for integrating new capabilities and automation into our facility. we have a lot of work to figure out where it makes sense for us and our customers. The decision would be much easier if we were fully dedicated to one machine provider, or if our plan was to go 100% automated. As it stands, our solution is going to be a mix of different machine manufacturers and different levels of automation. As the saying goes, "There's more than one way to skin a cat.". This is no different—there are a thousand ways to set it up. We need to decide which one works best for us and, more importantly, for our customers. In the coming weeks, we'll huddle, crunch numbers, and formulate a plan. Together, we'll find the solution that moves material through our facility and meets the needs of our customers and exceeds their expectation in the future. We're excited to see where we end up.